I am a psychologist and I work with teenagers/adults, my specialties. My son and I have a new center of Kundalini Yoga, Tai Chi Chuan,Pilates and Aikido - KR DOJO ACADEMIA. I speak Italian, Portuguese, a little Spanish and English. Now I have four pretty granddaughters, Valentina,11 years old, Cora 9 years old, Kira 4 years old and Kimi 2 years old. I'm a professional Trainer and having completed level 2 I'm waiting for the right moment to start level 3. I participated in several training courses in Sao Paulo and Ribeirao Preto, with Gian Kaur Khalsa our leader. I participate in White Tantric Yoga always. 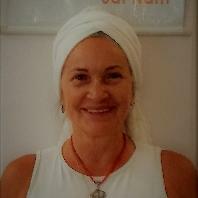 I never stopped teaching kundalini yoga, always following faithfully and respectfully the teachings of Yogi Bhajan.